My neighbor never took care of the mother Aloe Vera and never watered it at all for years. The mother had literally at least 50 pups and when I removed them the outer leaves were so dead and dormant I had to cut them way back leaving a long barren stem from where I removed the dead leaves. I have most with at least 6 inch stems and the tops do have at least 4 leaves. Question: do I stick the pups into the pot with the long barren stem and will they regrow and if not how will the tops fair? I do see new leaves so I know they are not totally dead but I am not sure if I should cut off the barren stems and try to re root or being the all have hefty roots just stick them in the pot with the roots in soil and the barren parts will regrow. 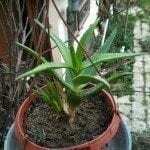 To my knowledge, the aloe will always grow new leaves from the center I have never seen it grow leaves from the root on the stem. Please advise, as I said I have so many I hate to see them go to waste. As long as the pups have one good leaf they should transplant just fine. Make sure you move the new plants to new pots with good quality gritty potting mix. The link below will help you.